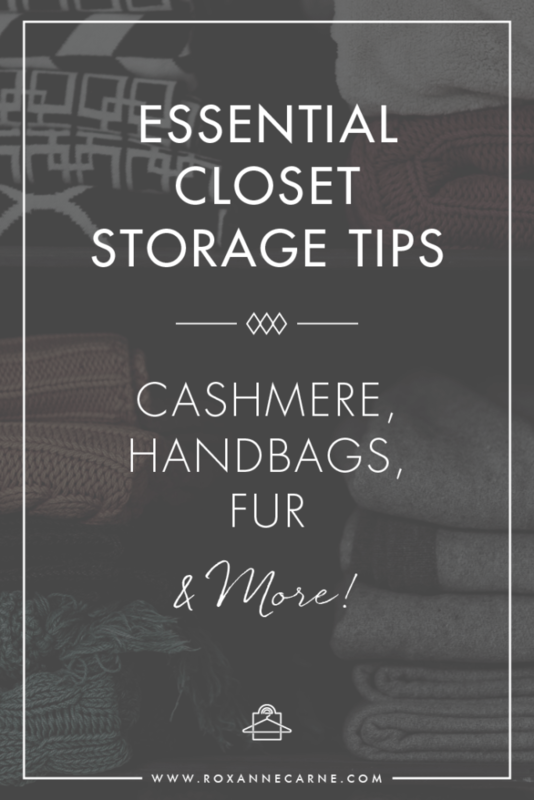 Essential Closet Storage Tips: Cashmere, Handbags, Fur & More! 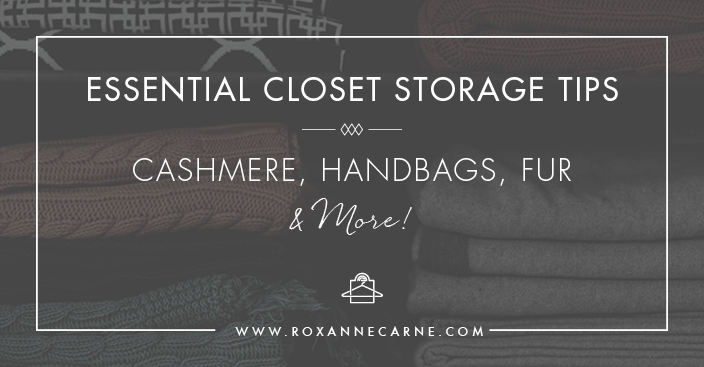 When you look in your closet are you proud of how you store your clothing and accessories? Do you know the best way to store certain items of clothing? Often times, my clients ask me for tips on how to store particular pieces so I thought I’d collate a few of them for you! Proper storage of your clothing and accessories is essential to maintaining a wardrobe you love, protecting your investments, and saving money! You’ve paid for pretty much everything in your closet so do take good care of what you’ve got. Okay, let’s get started! For suits that are in regular rotation for the season, keep them dry cleaned in a timely manner and neatly hung up in your closet on suit hangers. Do not ever store them (or any other item of clothing) in plastic bags – your clothes need to breathe. For suits that are out-of-season or not worn very regularly, it’s best to keep them in cloth garment bags to avoid collecting dust – yes, dust lives in your closet! Cashmere & Wool – soft, warm, luxurious and lunch for moths! To deter moths and keep your cashmere & wool items from looking like Swiss cheese, wrap them in white acid-free tissue paper and place in a cedar chest. If you don't have a cedar chest available, no worries! You can keep these items in a drawer (along with the acid-free tissue paper) with cedar drawer liners or cedar balls to keep these pests away and keep your sweaters smelling fresh. Getting dolled up in ball gowns and other formal dresses is certainly a treat! You definitely want to keep them looking fresh and ready for their next debut. After wearing a formal dress, always get it dry cleaned, gently wrap it in white acid-free tissue paper, and store in a roomy, breathable cloth garment bag. For my ladies with fur coats, this one’s for you! Fur coats take a little bit more care when putting away for storage. 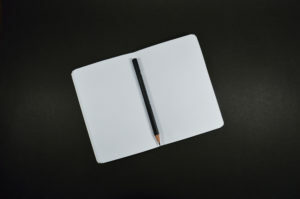 In general, they need to be stored in a cool environment (here’s an awesome article that explains why this is so important). 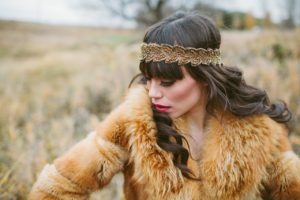 In the warmer months, it’s recommended that you store your coat at a furrier facility because they have climate and humidity controlled storage units that keep the pelt intact. If this isn’t an option for you, I recommend storing it in a very cool place in your home that isn’t too humid. Make sure that you hang your coat on a broad, fur coat hanger that will offer enough support for the weight of the coat; its broad neck also support the larger collar. Again, I recommend storing it in a breathable cloth garment bag to best protect the coat. Never ever store your fur coat in plastic bags, and never store it with cedar or moth balls as the scent is very difficult to remove and the cedar oils can actually damage the fur. I recommend storing your leather handbags on a shelf in a cloth bag to keep the dust away. Most designer handbags come with a complimentary storage bag but if you don’t have one, you can easily order it from Amazon (gotta love Amazon!). But the most important thing to remember here is that you should always keep them stuffed to help retain their shape. White acid-free tissue works well here but here’s a quick tip. I love using those small air pillows that come with packaging when you order items from Amazon (or anywhere else). They make great purse stuffers and it’s a nice green solution, too! I couldn’t finish this blog post without sharing one more general storage tip with you. Please do not use mothballs in your closet or drawers – EVER. The scent is extremely strong, you can smell it a mile away, and isn’t pleasant at all. Please use cedar instead – it accomplishes the same result and is a much better scent! If you have a question on how to store a specific item in your wardrobe, please contact me with your question. I’m also happy to visit your wardrobe and help you build great storage solutions too! Great article! I’m planning on having essentials in my closet, and this is certainly helpful. 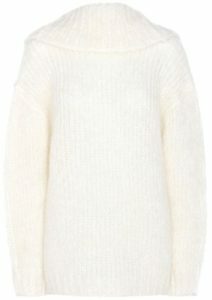 I like how you mentioned that a cashmere sweater is soft, warm, and luxurious. I think I’ll purchase one. So glad that was helpful, Spencer! Yes, cashmere is very luxurious and incredibly lightweight and warm – nothing beats it!